Noccaea fendleri subspecies glauca. Synonyms: Noccaea montana, Thlaspi montanum. 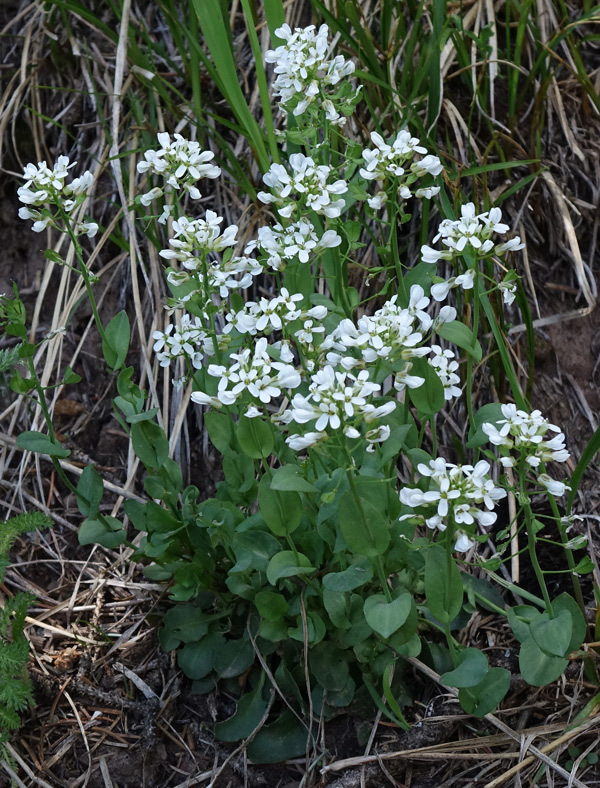 (Wild Candytuft, Pennycress). Lower montane through alpine. Woodlands, openings, meadows. Spring, summer. Above: Colorado Trail, June 19, 2015. Left: Ryman Creek Trail, June 16, 2005. 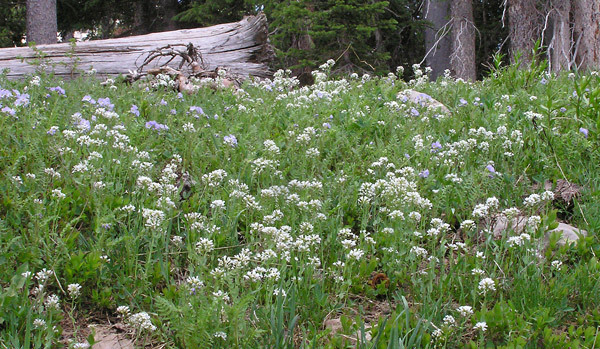 Although a slim, small plant, Wild Candytuft is noticeable for several reasons: It often grows in large patches providing a carpet of white flowers (see below); it commonly grows with few other plants around it; and you see it all spring and summer as it follows you in flower from low canyons and foothills early in the spring to high mountains and tundra all summer. 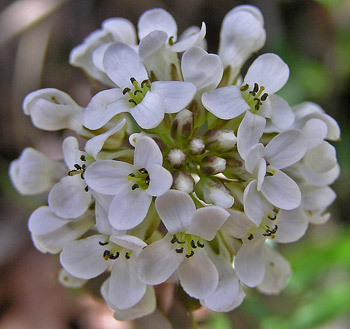 Candytuft often begins flowering when only one inch tall and the flower stalk elongates and continues to produce flowers as the plant matures. 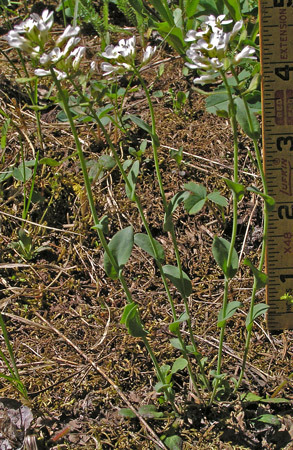 Seed pods, shown below, help to identify Noccaea fendleri , as do the stem leaves, shown at left. The genus name, "Noccaea", was given in 1802 by German botanist Conrad Moench (1744-1805) to honor the Italian clergyman and botanist, Domenico Nocca. (More biographical information about Nocca.) Our species was first named Thlaspi montana by Linnaeus in 1753. 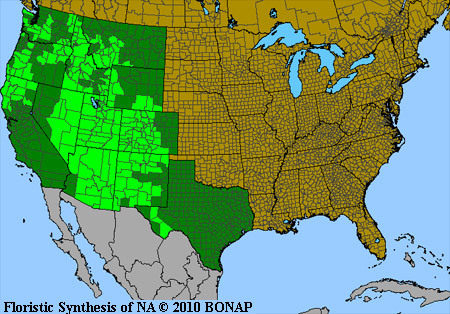 It has undergone more than a dozen name changes since then, including Thlaspi coloradense in 1901 by Rydberg from a specimen collected by Bessey near Pikes Peak. 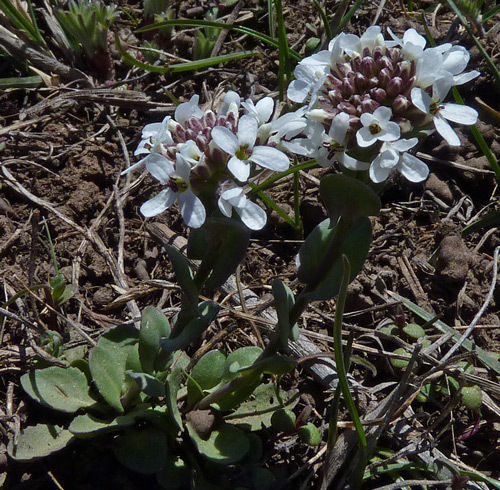 Weber's 2012 edition of Colorado Flora accepts Noccaea fendleri as the correct name and indicates that Noccaea montana, the name given it in 1973 by Friedrich Karl Meyer, is for the "strictly Eurasian" species. 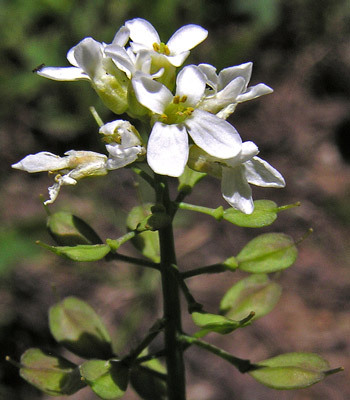 2004 research by Brassicaceae experts Al-Shehbaz and Koch indicated that the plant should be named Noccaea fendleri subspecies glauca. Ryman Creek Trail, June 16, 2005. 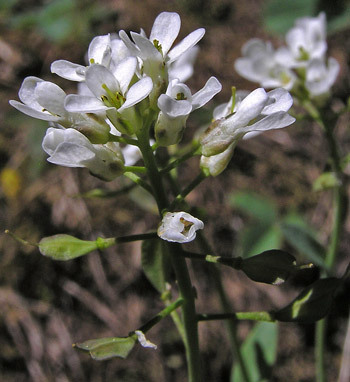 Flowers are intensely white with green to purple sepals. Horse Creek Trail, June 21, 2005. The flattened shape of the seed pod, and its pointed tip, horizontal growth, and color are all key factors in identifying N. fendleri. Southwest of Lone Cone, May 7, 2010. Cinnamon Pass, August 1, 2007. Pink flowers are uncommon and striking. 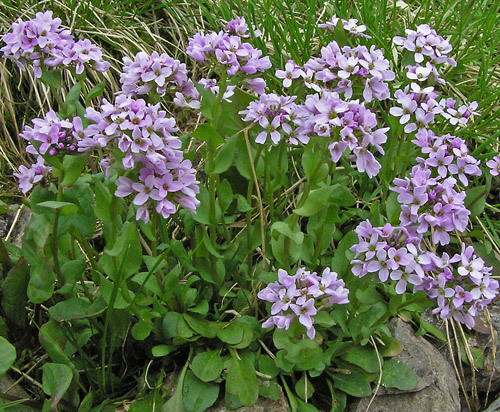 These alpine plants are just three inches tall. Sharkstooth Trail, June 25, 2008.